Former State Dept. Official Hillary Mann Leverett: Obama Likely to Mirror Bush’s Second Term Policy on Iran | Democracy Now! Middle East analyst and former State Department and National Security Council official. She is the CEO of STRATEGA, a political risk consultancy. She was the director of Iran and Afghanistan Affairs at the National Security Council. From 2001 to 2003, she negotiated with the Iranians over Afghanistan, al-Qaeda and Iraq. AMY GOODMAN: Senior diplomats from the United States, Britain, China, France, Germany and Russia are gathering today in Germany to discuss Iran’s nuclear ambitions. The previously scheduled talks come a day after Tehran announced it’s launched its first domestically made satellite. The White House responded to Iran’s satellite launch by describing it as a “matter of acute concern” and adding it would deal with Iran using “all elements of our national power.” The comments were made by White House Press Secretary Robert Gibbs at Tuesday’s briefing. ROBERT GIBBS: Efforts to develop missile delivery capability, efforts that continue on an illicit nuclear program, or threats that Iran makes toward Israel, and its sponsorship of terror are of acute concern to this administration. The President is clear that he wants Iran to be a responsible member of the world community. Again, I would underscore the “responsible,” that with that goes responsibilities. The actions — this action does not convince us that Iran is acting responsibly to advance stability or security in the region. All of this continues to underscore that our administration will use all elements of our national power to deal with Iran and to help it be a responsible member of the international community. AMY GOODMAN: Secretary of State Hillary Clinton also expressed concern over developments in Iran Tuesday. HILLARY CLINTON: Well, we are obviously concerned about Iranian behavior on a very broad base. It’s not limited to any one event or activity. And as you know, we’re undergoing a comprehensive review of how best to approach Iran and how to influence its behavior going forward. HILLARY CLINTON: As President Obama said, we are reaching out a hand, but the fist has to unclench. And we will see how we proceed together toward a policy that we believe represents the objectives that we share vis-à-vis Iran. AMY GOODMAN: Clinton’s words echoed President Obama’s message to Iran in his interview last with the Arabic-language channel Al Arabiya. The Iranian President Mahmoud Ahmadinejad responded to Obama’s offer during a speech at a rally in Tehran last week. He called for “fundamental change” in US policy to Iran. PRESIDENT MAHMOUD AHMADINEJAD: [translated] Those who say they want to create change, this is the change. They should apologize to the Iranian nation and try to make up for their dark past and all the crimes they have committed. We welcome change, but on the condition that change is fundamental and is on the right track. AMY GOODMAN: I am joined right now in Washington, D.C., by a former State Department official who was one of a small number of American diplomats authorized to negotiate with Iran from 2001 to 2003. Hillary Mann Leverett is the former director of Iran and Afghanistan affairs at the National Security Council. She’s now the CEO of a political risk consultancy called — well, Hillary, you can help me — STRATEGA and writes frequently about how the United States should approach Iran. One of her best known pieces, co-written with her husband Flynt Leverett, is called “The Grand Bargain.” It appeared in the Washington Monthly and the New America Foundation website last October. Hillary Mann Leverett, welcome to Democracy Now! How do you pronounce your company? AMY GOODMAN: STRATEGA. “The Grand Bargain,” what is it? And can you respond to the launch, Iran says, of a domestic satellite? HILLARY MANN LEVERETT: Yeah, let me take the domestic satellite piece first. I think, you know, any time Iran takes a step toward possibly promoting an unconventional weapons program, whether it’s for research or otherwise, has to be of concern to countries that don’t have a diplomatic or otherwise good relationship with Iran. So, of course, we’re going to be concerned about that. AMY GOODMAN: And how do you determine it, by the way, whether it’s a fake or not? HILLARY MANN LEVERETT: Well, there are a lot of ways that the intelligence agencies here and in other countries can look at footage. The Iranians actually, you know, put everything on live television, or they’ve tried to put it onto, you know, a website to show that they’ve done the launch, to prove to themselves, to Iranians inside, in particular, that they’ve taken this step. So there’s a lot of things that you can look at. We also have a variety of kind of capabilities to understand what goes on inside Iran, but it’s not perfect. And that’s why I caution that even if there’s been an announcement -— you know, we certainly saw Saddam Hussein frequently talk about his various unconventional weapons programs, and that didn’t turn out to be the case. So we need to be really cautious here, particularly in light of the August determination that the launch wasn’t — you know, didn’t really have the — was not true, was a fake. That was the determination here. So we need to be really careful. AMY GOODMAN: And the second part of what you were saying? HILLARY MANN LEVERETT: The second part, I think, comes from this issue of the space launch and our concern about it here and our allies’ concern about Iran’s potential proliferation capabilities. For me, the way I see it, the fundamental question is, how do we view Iran today, thirty years after the revolution that brought us the Islamic Republic? Your interview with Shirin Ebadi was very, very interesting and, I think, important. Thirty years later, Iran is no longer really an immature revolutionary movement. It is the government; the regime is a mature polity, I would argue, increasingly capable of taking rational decisions to promote its national self —- its national interest, to act instrumentally and rationally to promote the interests of Iran as a nation-state and particularly to protect itself and to look at its legitimate security concerns and to take steps to protect itself. That’s, I think, a really important way to try to look at Iran. In contrast, the predominant conventional wisdom here in Washington, the way a lot of people look at Iran, without very much evidence -— I’d say with no evidence — is that Iran is ideologically driven, bent on becoming history’s first suicide nation, that they’re going to develop a nuclear weapons program and actually use nuclear weapons in a way that’s not deterrable, a first-use — they’re going to actually use them in a first-use situation. We have no evidence of that. You know, in contrast, when you look at Iran’s — how Iran behaved during the Iran-Iraq War in the 1980s, an eight-year war where more than half-a-million Iranians were killed, in part with Saddam Hussein using chemical weapons against them, the Iranians decided, took a decision — we actually — you know, now there is archival material that shows some of the debate within the Iranian leadership — they took a decision not to use chemical weapons back against the Iraqis. So we actually have some sense of an ability by the Iranians to take some pretty severe hits and to not go first to some sort of unconventional weapons option to use against even its archest foes, like Iraq was during the 1980s. So, you have this idea here in Washington that Iran is ideologically driven to become history’s first suicide nation, with, I think, very little, if no, evidence to substantiate that, versus what I see as really an Iranian polity thirty years later, thirty years after the revolution, that is increasingly capable of taking rational steps and to act instrumentally to promote its national interests. And in that regard, the way I think it’s critically important to look at Iran today, for this administration to look at Iran, is through what Iran says are their legitimate security interests, their legitimate security concerns, and for this administration to try to get at those legitimate security concerns and to provide Iran with security guarantees to try to meet those security concerns. 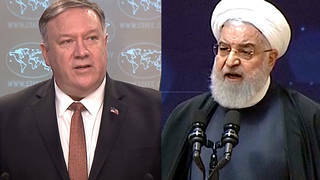 Now, here in Washington, for any administration to give the Iranian government, this Iranian government that supports groups like Hamas and Hezbollah, to give that government security guarantees would be anathema. It just wouldn’t be possible the way our politics are configured here, and it wouldn’t make much sense, if Iran was to continue to support groups that took actions, sometimes violent, against Americans or American allies. So, to me, the critical — the way to look at this, to unlock it, to unpack it, to get through this kind of Gordian knot, is to firmly put on the table that we are willing to give Iran security guarantees — and we can go into how do you make that tangible — give Iran security guarantees, and Iran would need to commit to not provide weapons or money to groups that could take violent — could take violent steps, violent — attack violently the United States, Americans or our allies. To me, that’s kind of the core of the bargain, and it would then be the basis of a grand bargain that would deal with all of the issues that are of concern to Iran and of concern to the United States. It would be very similar to the way that the United States and China fundamentally reoriented their relationship back in the early 1970s. There wasn’t a question of, you know, China had to become a nice, gentle country, that Mao had to leave office, that we couldn’t deal with him — none of these questions that you hear similarly said about Iran. We didn’t do that with China. We basically recognized China as an important country with its own self — with its own national interests, and we struck a grand bargain with them for fundamental rapprochement. I think we really need to do the same thing with Iran today. AMY GOODMAN: Hillary Mann Leverett, the elections that are coming up in Iran, who is running? And the significance of Ahmadinejad right now, his popularity, or not, within Iran? HILLARY MANN LEVERETT: You know, it’s interesting. Almost — not almost, every president in Iran since the advent of the Islamic Republic in 1979 — every president has had two terms. They’re term-limited, which, you know, it’s interesting, because we often rebuke Iran as a dictatorial country, as an autocratic state. But in fact, they’ve had elections, you know, every four years since the advent of the Islamic Republic, and every president has had two terms. The democratic process, the election process, is seriously flawed, as your prior guest Shirin Ebadi very articulately laid out. But it is an important process. It is a competitive process. It is not a sure thing. So, for example, when Ahmadinejad ran last time and was elected as president, he was the dark horse. He was nobody’s chosen candidate, not even the Supreme Leader, as we sometimes hear. And before him, the reformist, President Khatami, was elected also in a surprise election. But Khatami, even though he was elected in a surprise election with no — almost no support from the clerical establishment, he stayed for two terms. So here we have Ahmadinejad, who I think also came to office and pretty much as the dark horse candidate. I think he probably is going to serve another term. I think that has more to do with, as we see sometimes in this country, a certain kind of lethargy within the populace, not a very dynamic political debate, and a sense, I think, from the Supreme Leader and the clerical establishment that it’s probably good for Iran, for its stability, to have a president serve for two terms. So I think there is a built-in institutional bias in favor of just letting the president stay for two terms. He’s term-limited anyway; he’ll be out in another four years. So I think that probably the odds are that even with Ahmadinejad taking some hits in his popularity over the past couple of years, particularly because of the economic situation, I think the odds are that he still will be reelected in June. He does have some competitors. The mayor of Tehran, who has a similar background to Ahmadinejad — you know, Ahmadinejad actually was the mayor of Tehran before he became president. This person, his name is Ghalibaf. He is the mayor of Tehran, is looked at as a pragmatic conservative, a technocrat, similarly to how Ahmadinejad was actually viewed before he was elected president. Ghalibaf has strong ties to the Revolutionary Guard, as Ahmadinejad does, as well. So, the two of them — sometimes people say, well, Ghalibaf is going to be a more pragmatic conservative. We often hear that here in the West, because I think there’s a lot of wishful thinking that somehow we’re going to get somebody more to our liking in the polity, rather than looking frankly and transparently at what needs to be done substantively between the US and Iran. But there’s a —- I think there’s a great tendency here to try to see who’s going to be a good player. I don’t think Ghalibaf is going to be much better for us, in terms of being someone who’s more pliable than Ahmadinejad, but he’ll be another candidate, perhaps. AMY GOODMAN: Hillary Mann Leverett, we have to wrap up, but I do want to ask if you see a real shift with President Obama’s administration. HILLARY MANN LEVERETT: I don’t. I think you’ll probably see a lot of a continuation of the Bush second term, a policy potentially that — Bush’s first term — second term was carrots and sticks. I think Obama is going to try to pursue more carrots, more sticks, which I think will not change the strategic calculation inside Iran. The strategic calculation, I think, is one of self-protection for the country, for the state. And that basic self-defense strategic calculation is not going to be altered by some more economic goodies, in terms of carrots, or [inaudible] sanctions. AMY GOODMAN: We’re going to have to leave it there. Hillary Mann Leverett, Middle East analyst, thanks for joining us.